After a wonderful end of summer trip to Maine, the flurry of getting the kids back to school, and some last minute gardening and room painting, I feel I am finally getting into an autumn state of mind. 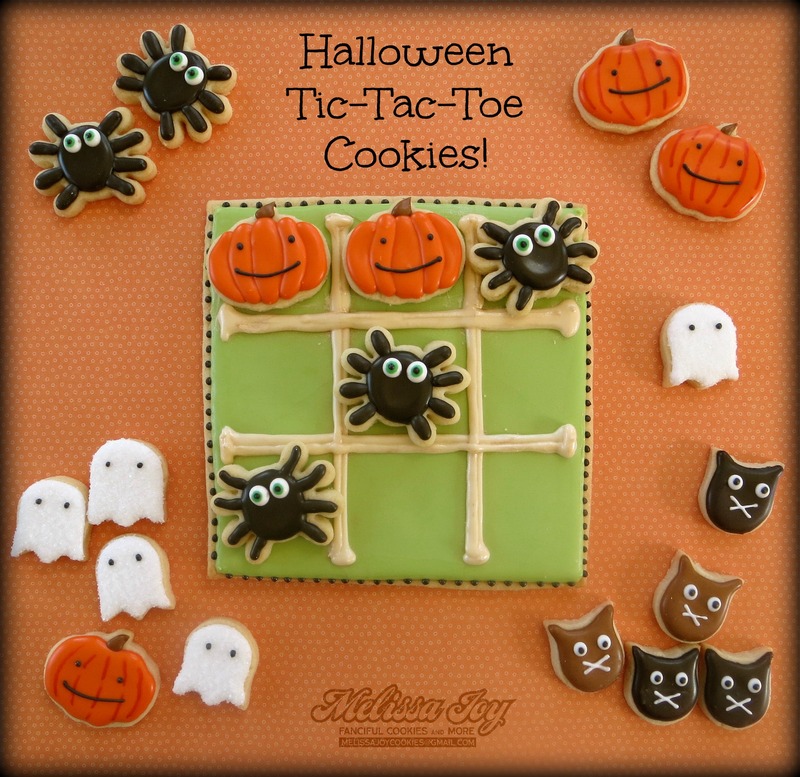 Halloween items are out in force, so inspiration abounds for creating festive cookies. I’ve got a few ideas at the ready, but here’s the first I’ve made so far! 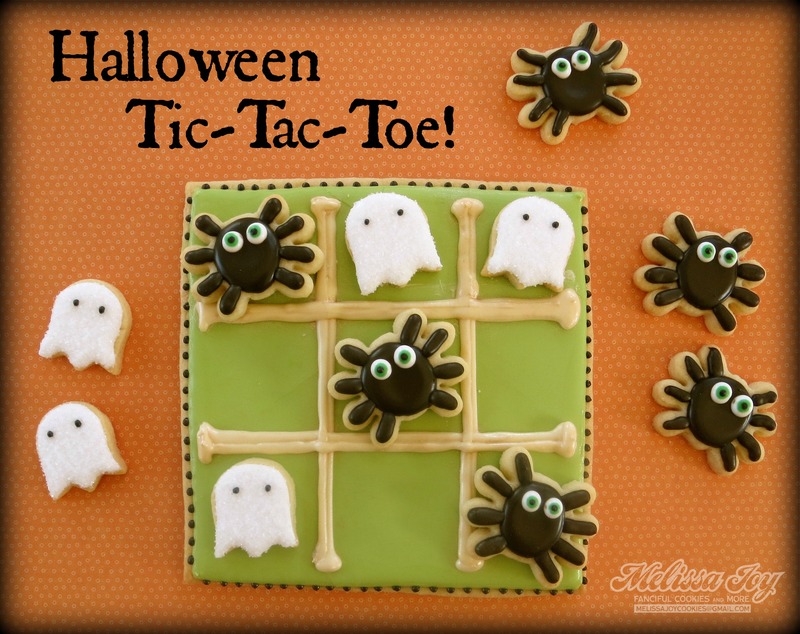 Halloween Tic-Tac-Toe! I love cookies that double as games, like the domino cookies I made for Valentine’s Day. Gives you permission to play with your food and not get into trouble. 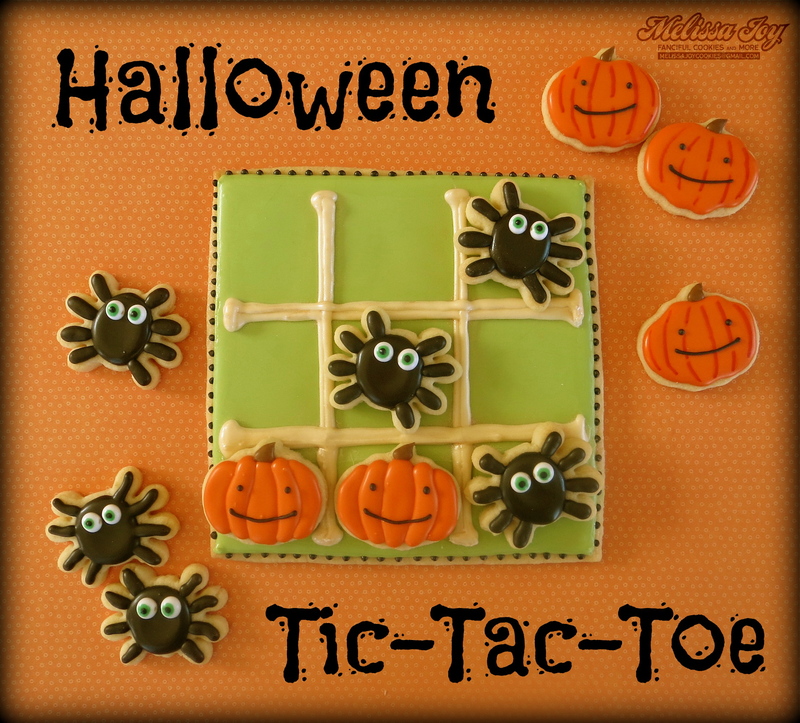 The options are endless for the minis you could make to go with the tic-tac-toe “board”….eye balls, candy corn, colored leaves, acorns. I’ve also been thinking that other themes or holidays would be super cute as well. Oooooo, the possibilities! 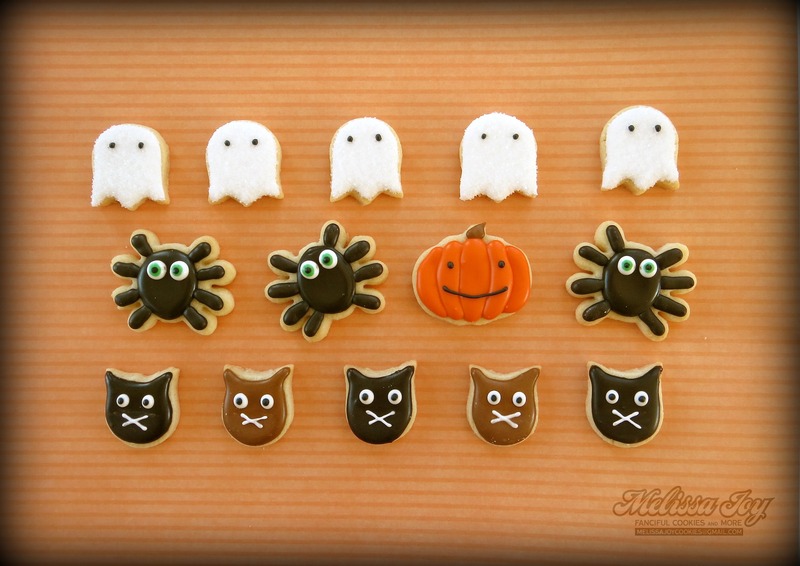 I would like to give a shout out to one of my favorite cookie artists, Michelle at Make Me Cake Me, who came up with the idea for the teeny ghosts in her blog post here. Once I saw ’em, I knew I had to try ’em! I decided to add sanding sugar to mine this time around. Minis can be a bit of a pain, but you can’t deny their cuteness. My littlest was delighted to play a few rounds with ol’ Mom! His favorite pieces to use were the little owls, but I forgot to take pictures of those. My bad. No matter, we’ve got some more mini cookies saved for his playdate tomorrow. All they’ll need is some milk, and their after school snack is set! 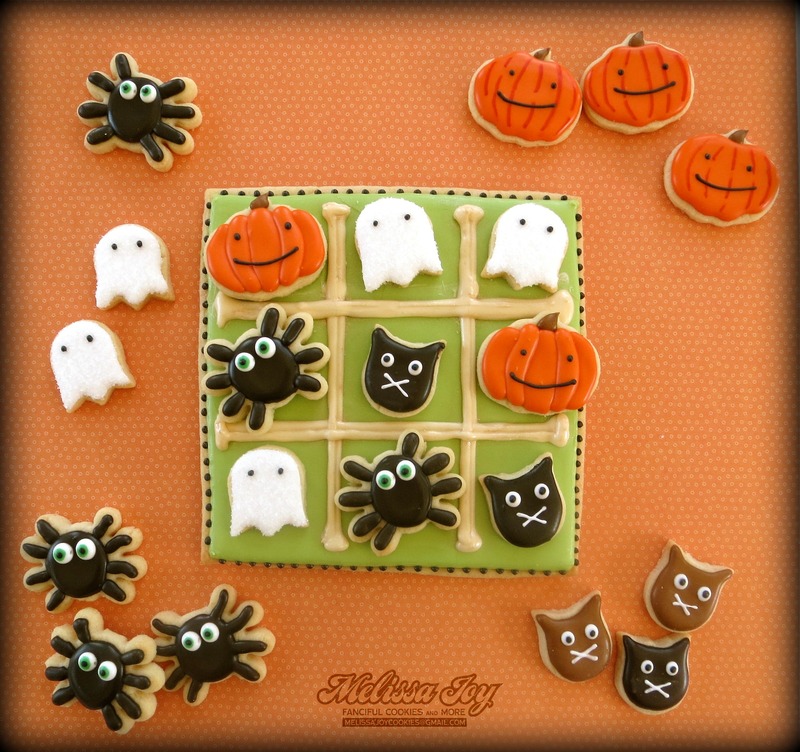 This entry was posted in Fall Cookies, For Fun Cookies, Halloween Cookies, Holiday Cookies and tagged autumn cookies, cat cookies, ghost cookies, Halloween Cookies, halloween tic tac toe, kids games, pumpkin cookies, spider cookies, Tic Tac Toe. Bookmark the permalink. You are full of creative ideas!! I love how you could take this idea and easily go from scary Halloween to friendly Autumn, or any other holiday for that matter! Incredible! These are too cute! I know my kids would love these. My daughter is a Tic-Tac-Toe junkie! Thank you for posting these. Thanks so much, Nicole! They are so easy to do…let me know if you try it! These are just ADORABLE!!! I love them so much! I absolutely love this idea! What a fun idea to help kids gets in the Halloween mood! Thanks so much for shouting out my lil ghosts (you’re one of my faves, too!) and I totally agree re: minis being both a pain and incredibly cute. 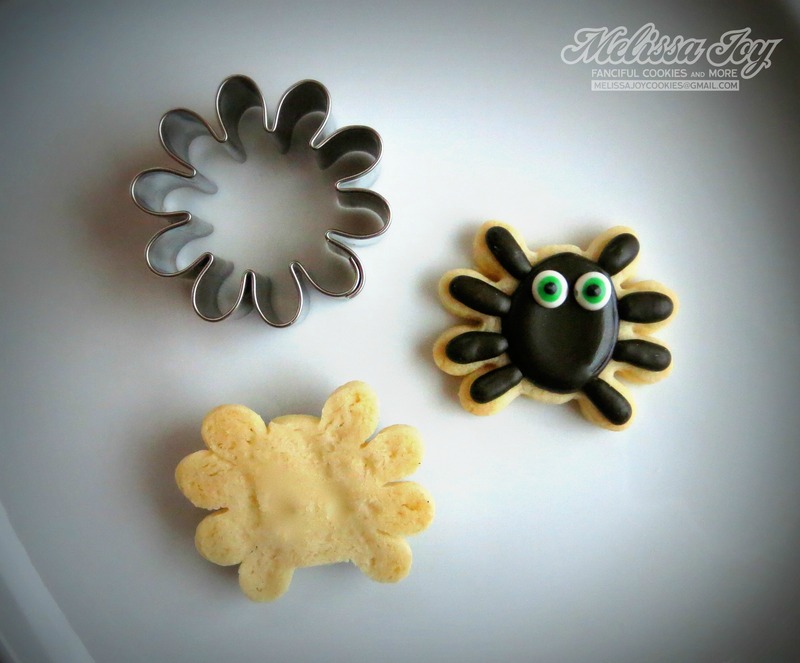 Also, I’ve got to say, I love your googly-eyed spiders best! So goofy cute! Super cute idea! What size is your game board cookie? Thanks so much! It’s about 5.5 x 5.5 inches. I had to make sure it was big enough to fit the pieces I wanted to use 3 across. I could have made it a little bigger, but it was the last of my dough! These are adorable my grandson would love it! I just don’t know how y’all all coming up with all these wonderful idea’s! It awesome for us that don’t think so fast … lol. Love all of your work it’s beautiful! One of the best ideas I have ever seen! Thank you ever so much for posting this idea! I love your cookies SOOOOOOOOO much!